Brandon Shaw, who scored the all-important goal for Ollerton Town at Harworth. 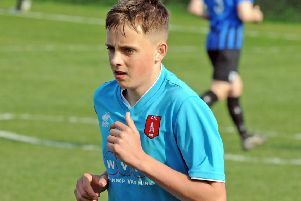 Relieved Ollerton Town are praying they have done enough to avoid the drop after a crucial victory over fellow strugglers, Harworth, on Saturday. Dave Winter’s depleted side ended a run of one point from seven games with a 1-0 win that lifted them out of the bottom three and above local rivals, Shirebrook Town, in the Northern Counties East League’s First Division table. Critically, they are now five points clear of next-to-bottom Harworth, with three more matches left to negotiate their way to relegation safety. Had Ollerton lost at Harworth, they themselves would have plunged into the bottom two. That’s important the game was, rekindling memories of another massive trip to Scrooby Road almost three years ago to the day when Ollerton’s 2-1 win sent them on their way to promotion from the Central Midlands League. This time, they had several key players missing and even had to field central defender Luke Pickering in goal. But they emerged with the points thanks to a solitary goal in the 25th minute from hero Brandon Shaw, who scored from a long throw into the box by Jake Tittley. Harworth responded with almost constant pressure, particularly in the second half. But Ollerton stayed strong, restricting them to few clearcut chances. Pickering pulled off one brilliant save and although the hosts rattled the bar with seconds remaining, Winter’s men held on.